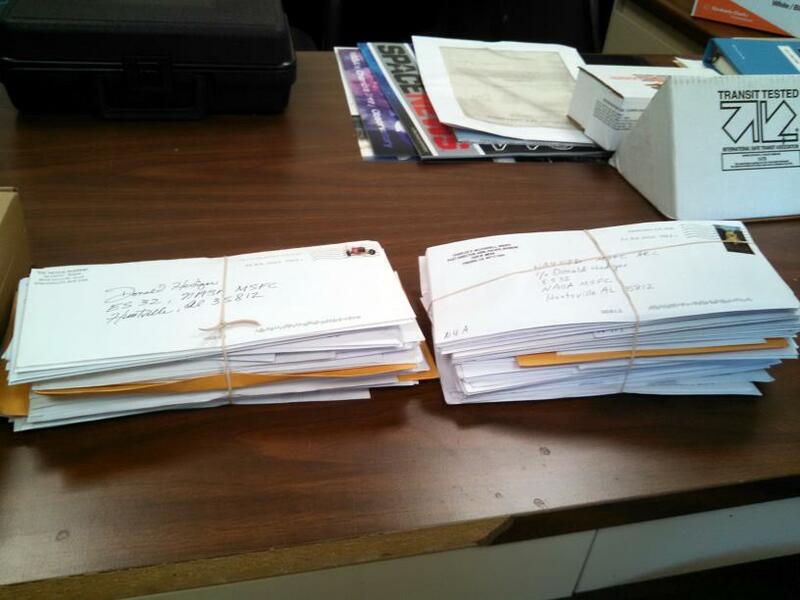 Our first batch of N4A QSLs were mailed on August 20, 2014. We QSL with ARRL Logbook of the World and eQSL. We have now checked our LOTW and eQSL databases for errors and mismatches. If you have questions regarding your QSLs with us, please contact us. Our email address is msfc-NN4SA(at)mail.nasa.gov. The Marshall Space Flight Center Amateur Radio Club (MARC), WA4NZD, will be operating a special event station to commemorate the 45th Anniversary of Apollo 11. We will be self-spotting on the DX cluster and will be on various bands and modes. QSL via Logbook of the World or eQSL. Paper QSLs will be available with an SASE to WA4NZD MSFC Amateur Radio Club, c/o Donald Hediger, ES32, Huntsville, AL 35812. Check http://wa4nzd.wordpress.com or WA4NZD on QRZ.COM for availability and other frequency announcements. Club stations from several other NASA centers and various museums will be on the air during the mission anniversary. A set of short chapters by key program participants that describe the history, the development of the program, and what was accomplished, with many photos, illustrations, and art. With full transcript of the Apollo 11 and other missions, and much detailed information. 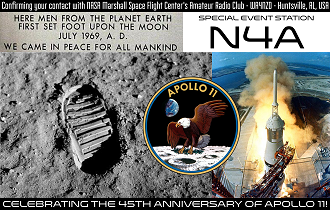 Our Apollo 11 45th Anniversary Special Event Station N4A was an outstanding success! Thank you for contacting us, and thank you for commemorating this special anniversary with us. Rob KB5EZ started the Apollo 11 anniversary special event during lunch break on Thursday July 17, operating 17 and 20 meter SSB. 45 years ago Apollo 11 landed on the Moon, and astronauts first walked on the lunar surface. President Kennedy was probably right, that no other single space project of that time was more impressive to mankind, nor more important for the long range exploration of space. The space programs of the 1960s with the Apollo lunar landings deeply influenced several generations, including us here. Our special event was intended to help all of us reconnect with that heritage. Our operation was timed to coincide with the actual dates of the Apollo 11 mission, which was launched July 16, 1969, reached lunar orbit July 19, landed on the moon July 20 with the EVA walk that evening, and splashed down on July 24 (CDT). We operated from July 17 to 22 (CDT). On the 20th and 21st we played short audio clips of the landing and EVA moonwalk communications. We were one of several NASA amateur radio clubs commemorating the anniversary; the others were WA3NAN at Goddard in Maryland and NA8SA at Glenn in Ohio. Also participating were the Huntsville Amateur Radio Club operating at the US Space & Rocket Center museum using W4A and W4R, the Cradle of Aviation Museum K2CAM on Long Island (not far from where Grumman built the Lunar Modules), and the actual Grumman Amateur Radio Club WA2LQO. We logged 1225 QSOs. Most QSOs were on SSB, but some were CW, RTTY, and FM as well. 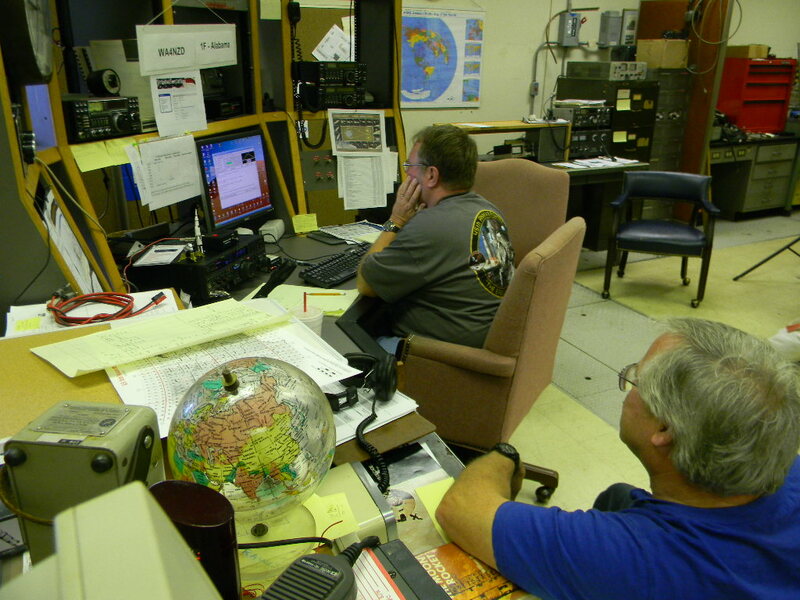 Most of our operations were on the 17, 20, and 40 meter bands. Our contacts were from most of the United States (including HI and AK) and several of its territories, 6 Canadian provinces, and more than 30 countries. Our longest-distance contacts were with Japan on 17 meters. We also contacted 3 of the other special event stations (WA3NAN, W4A, and K2CAM). The NASA Johnson station in Texas W5RRR contacted us. Some of our contacts had worked with the Apollo Program or other aspects of the space program. When we had time and there was interest, we and our contacts shared memories from that period. Our operators were KA0S, WA2JQZ, KK4IBB, N4CNY, N4MSN, KB5EZ, and WA8U. We also had invaluable logging help from Jenny McCollum and Joe Randolph. Our QSL card was designed by KK4IBB and KA0S, with help from Jenny, and additional help from club members. This was our most successful event since we reactivated the club a few years ago. We QSL with Logbook of the World and eQSL. Paper QSL cards are available with an SASE to NN4SA MSFC Amateur Radio Club, c/o Donald Hediger, ES35, NASA MSFC, Huntsville, AL 35812, USA. Our email contact address is msfc-NN4SA(at)mail.nasa.gov. 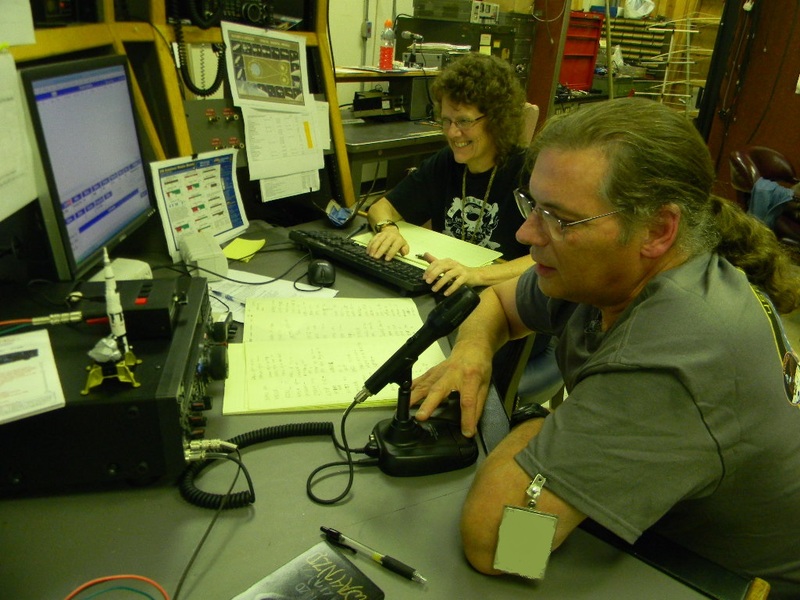 Matt KA0S operated RTTY and SSB Friday evening, with Jenny logging, and with John N4CNY. Rob KB5EZ on Saturday, with Stephen KK4IBB. Rob operated RTTY, and also tried 2 meter FM and the Internet Radio Linking Project (IRLP) to Alaska and West Coast reflectors. 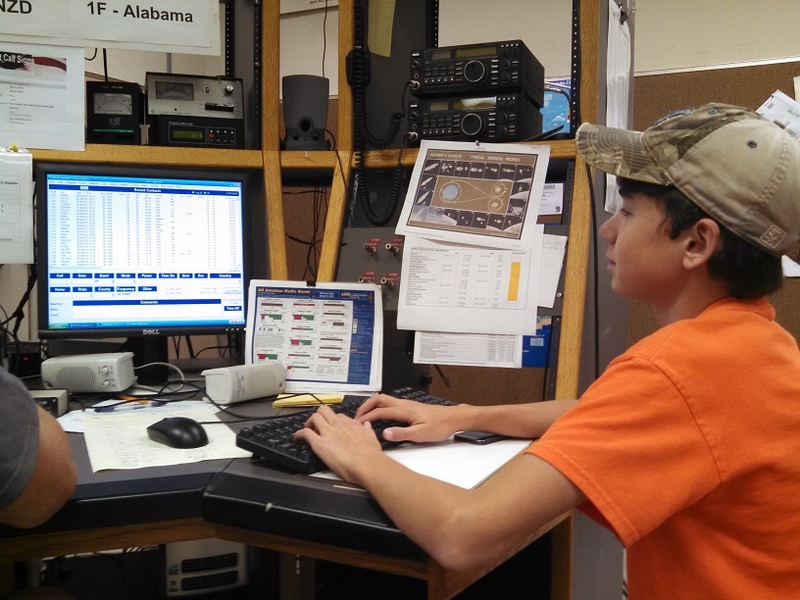 Stephen operated SSB Saturday and Monday afternoons. 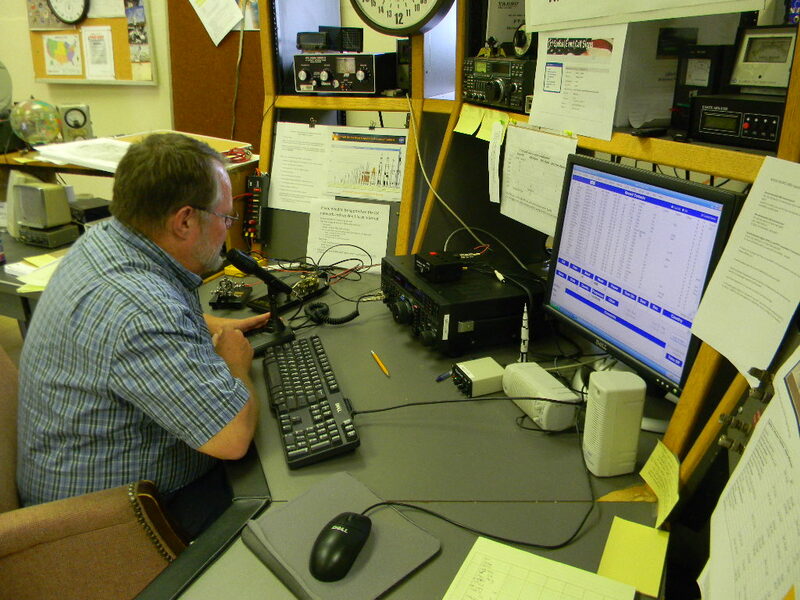 Gary WA2JQZ operated Saturday afternoon on 17 and 20m SSB. Band conditions were poor, but opened sufficiently to the western US and Pacific. That enabled contacts to Hawaii and Japan, and even to a few QRP stations in the US southwest. 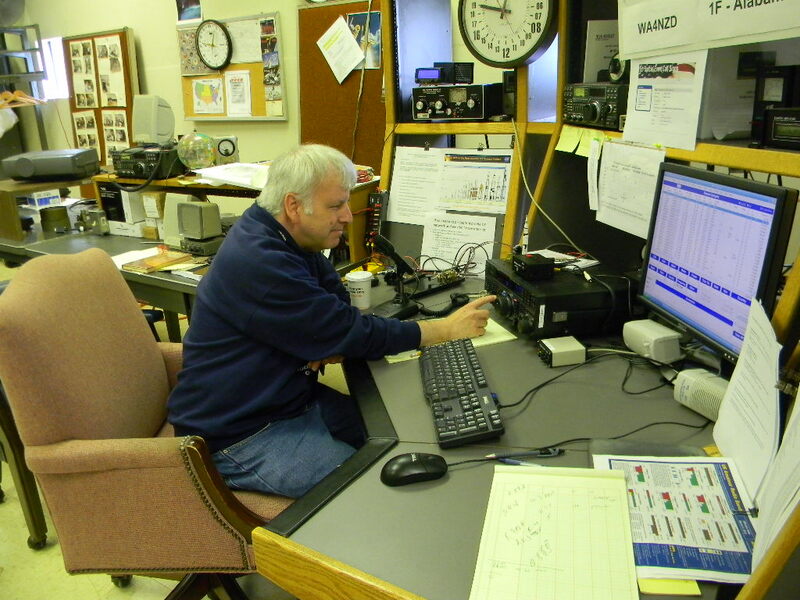 Gary operated CW and SSB on several days. 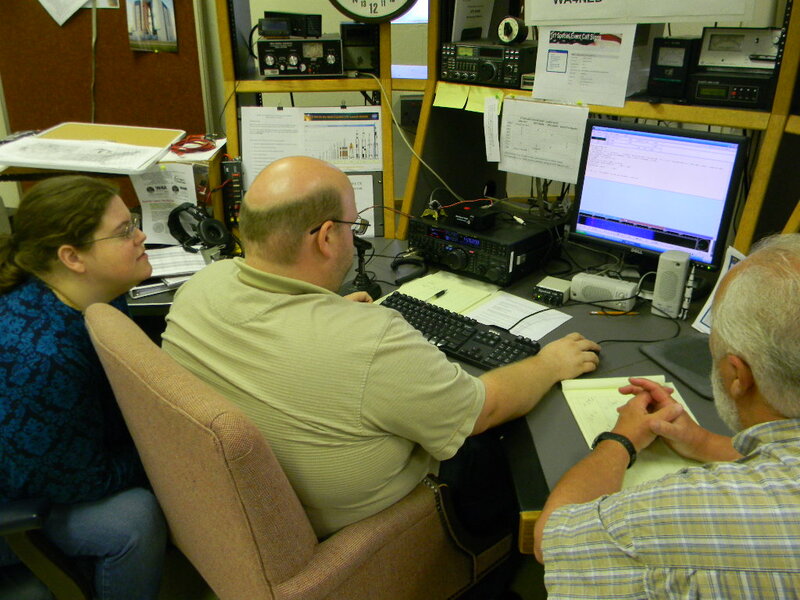 Don N4MSN at the mike Sunday evening, with Tina WA8U logging. Don operated or logged several of the late night shifts, on Thursday, Friday, and Sunday. You can learn more about the space program and the heritage from Apollo by visiting the US Space & Rocket Center — the visitor center for the NASA Marshall Space Flight Center and Redstone Arsenal — located on I-565 in Huntsville, AL. Its outdoor Rocket Park tells the story of U.S. rocket development during the 1950s and 60s. The Saturn V replica is a prominent landmark, visible from many miles away. Inside the Davidson Center building you can get close with a real Saturn V, plus many more items of Apollo and American space program hardware. The US Space & Rocket Center is the home of Space Camp. The NASA Marshall Space Flight Center developed the Apollo Saturn launch vehicles, and continues to serve a major role for the country. Its work supports all the major NASA directorates. Marshall is now developing the heavy-lift Space Launch System (SLS), which will give the country again the ability to send heavy payloads to deep space. The Apollo 11 Saturn V, as it rolled out from the Vehicle Assembly Building at Launch Complex 39 at the Kennedy Space Center in 1969. 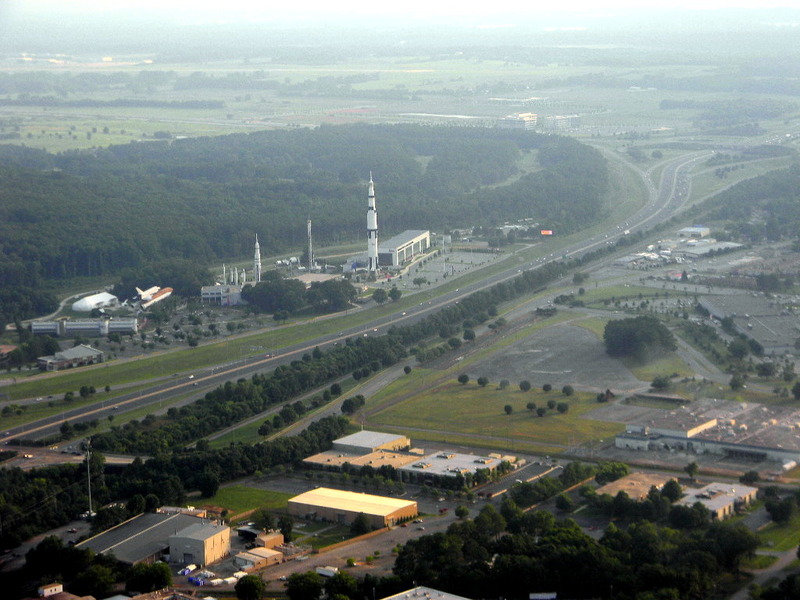 The NASA Marshall Space Flight Center was created in 1960, formed from the core Army rocket development team at the Redstone Arsenal. Some of its earlier space accomplishments were the Juno launch vehicle (a modified Jupiter C) that launched the first U.S. satellite Explorer 1, and the modified Redstone which launched the first US astronauts in suborbital flights during the Mercury Program. The original Army team undertook the development of large rockets for long range space exploration. After NASA was formed in 1958, the team was naturally incorporated into NASA, and its development work led to the Saturn class of launch vehicles. The three-stage Saturn V was the vehicle that launched the Apollo astronauts to the Moon. The photo shows Apollo 11 as it rolled out from the Vehicle Assembly building at Launch Complex 39 at the NASA Kennedy Space Center in 1969. Also developed and flown were the Saturn I test vehicles (10 were flown), and the Saturn IB, used for Earth-orbital flights. A modified Saturn V third stage became our Skylab space station, used by three crews (launched with Saturn IBs) during the early 1970s. In 1976 a Saturn 1B flew our crew for the Apollo-Soyuz mission in which U.S. and Russian manned spacecraft met and docked together in Earth orbit. The Marshall Center was also responsible for the Lunar Rover, a small car that enabled the astronauts on the last three Apollo moon missions to explore much further from the Lunar Module. The Marshall Center has been a key center for the Space Shuttle Program, including the Spacelab modules, and the International Space Station, now in orbit and manned. The space station’s Payload Operations Center is based at Marshall. 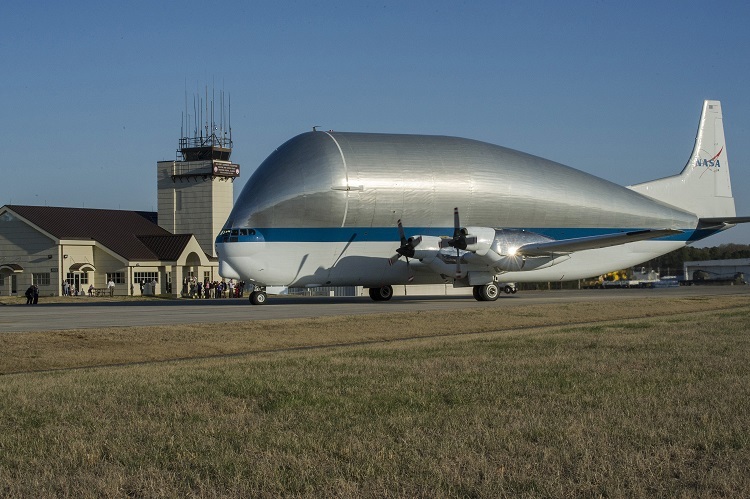 The Super Guppy at the NASA MSFC Redstone Arsenal airfield in 2014, delivering a composite fuel tank for testing. Posted on 2014/08/08 by wa2jqz, with N4MSN. Thanks to our many Apollo 11 anniversary contacts… Two weeks after the Apollo special event (July 17-22, 2014), we have received about 200 QSLs in the mail. We logged over 1200 contacts and we anticipate more will come. On ARRL Logbook of the World, we have so far matched about 500 QSLs. On eQSL, we have over 340 QSLs. Last week the club met, to work through our details for replying to the QSL cards. We plan to mail out our QSLs by mid to late August, 2014. Below are photos of some of what we’ve received to date. 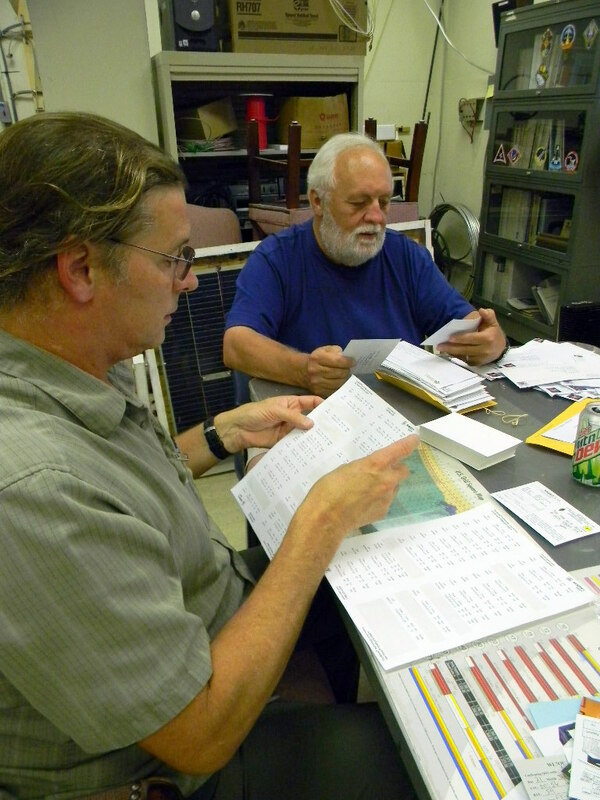 … Thanks to Don for keeping up with all our mail! 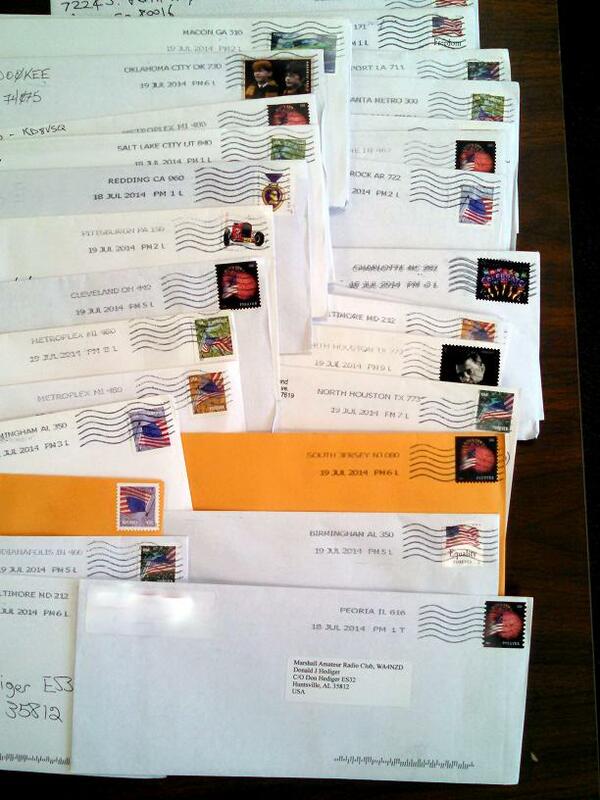 Thanks to our club members for verifying and responding to the mail! And thank you for contacting us and writing us! Two stacks of Apollo 11 anniversary event QSLs that arrived on Don’s desk. 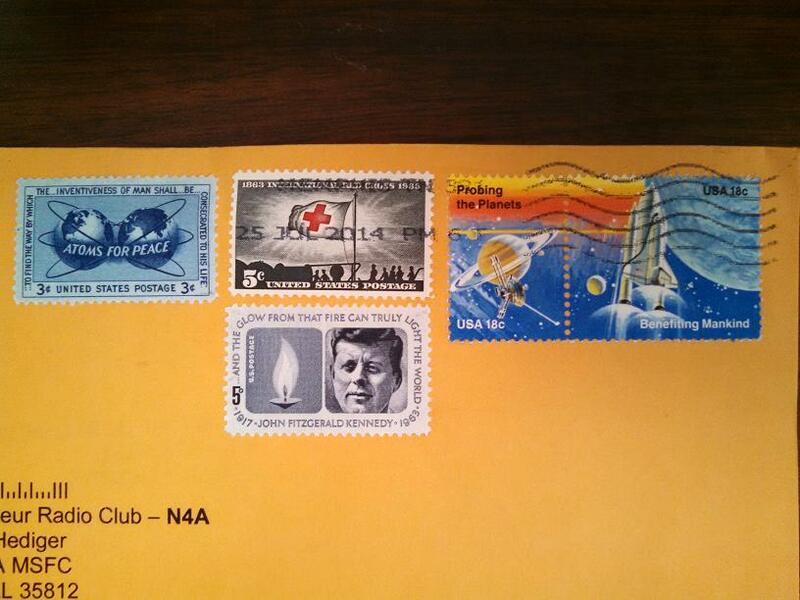 Assortment of Apollo 11 anniversary QSLs that arrived, with variety of stamps. 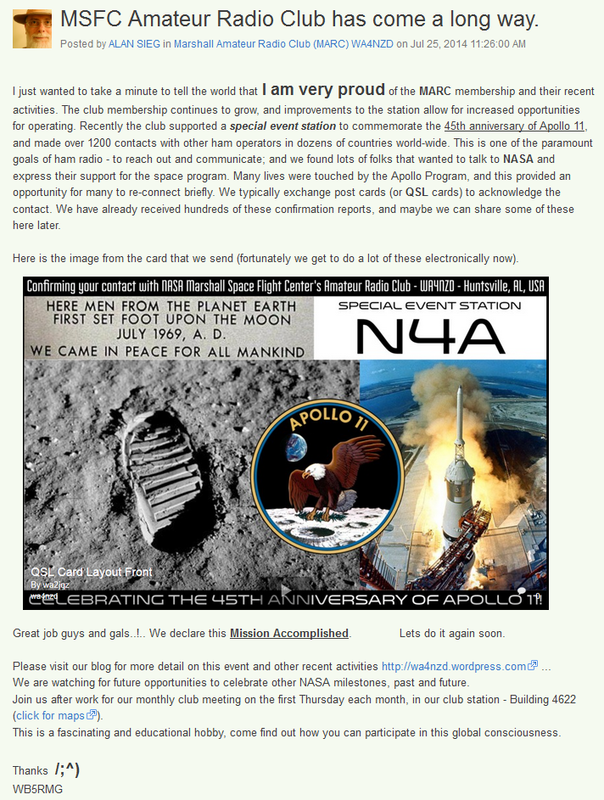 N4MSN and N4CNY replying to QSL cards for our N4A Apollo 11 45th Anniversary Special Event. 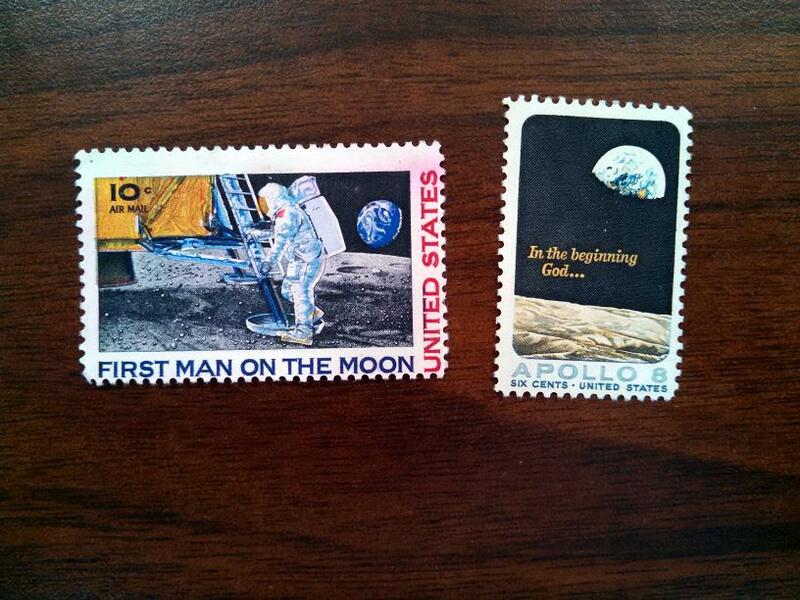 We received over 200 QSL cards for our Apollo 11 45th anniversary special event station N4A, that we operated in July. This afternoon we met after work to respond to them, with our special event cards. During the past week Matt KA0S and Don N4MSN set up a database for our contacts who mailed us, and Stephen KK4IBB printed individualized signal reports for them. Rob KB5EZ also set up a complete checklist from our log. Today we systematically responded to almost all of the cards we received. We read to each other messages that were included. 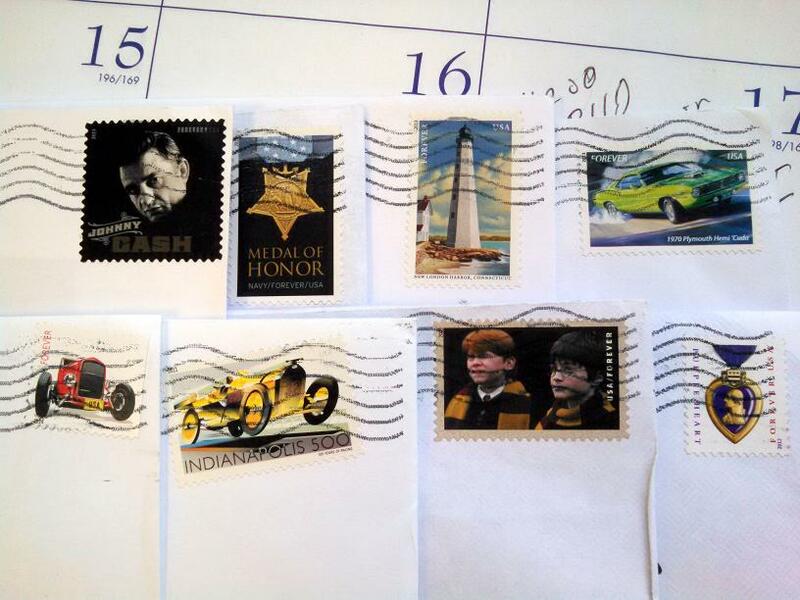 Many interesting individualized cards were sent to us, including some nice stamps. 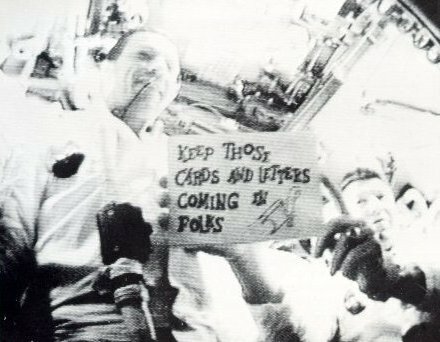 Just a few cards are not matching our log record, and we suspect some may be intended for the W4A Apollo anniversary station that was set up by the Huntsville Amateur Radio Club at the US Space & Rocket Center. Whatever the case, we’ll investigate each outlier. We sent our mail out this evening. 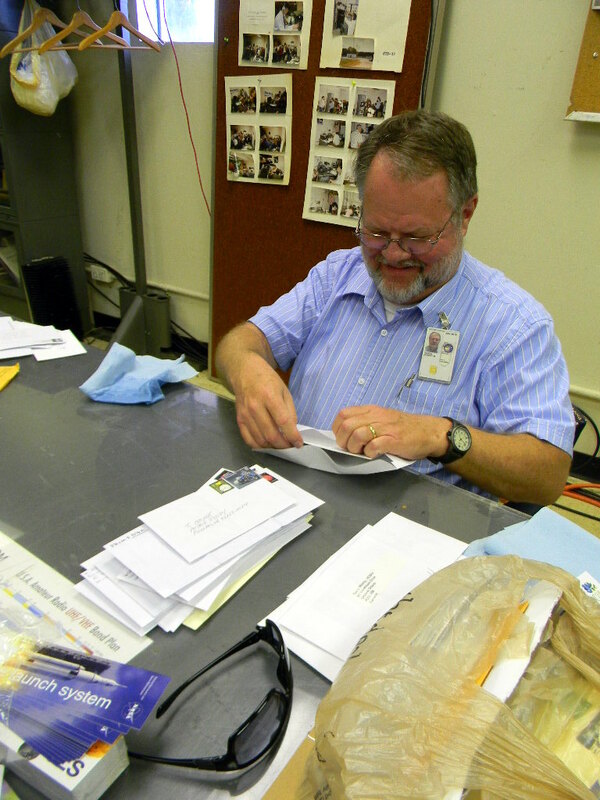 KB5EZ placing N4A QSL cards in envelopes for our contacts. Our QSL card team members this evening were John N4CNY, Don N4MSN, Rob KB5EZ, Gary WA2JQZ, Tina WA8U, and Stephen KK4IBB. 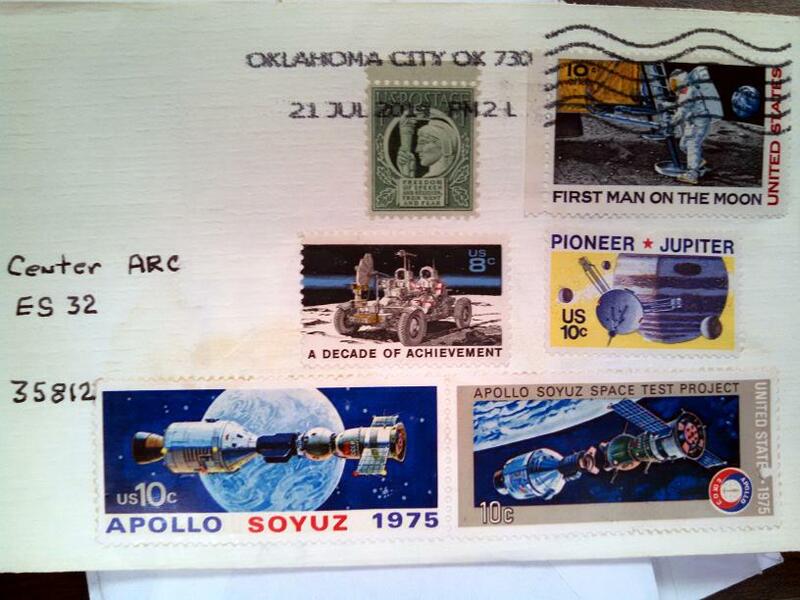 We anticipate we may continue to receive more QSL cards for the Apollo event, especially from overseas. We will respond to those, once they come. This evening’s work gave us a chance to look together at the whole group of cards, and talk about them. Our N4A special event QSL card.